I'm pretty sure the TCMA founders culled these black-and-white photos from their own collections. This 6-count, postcard-sized set shows Babe in several outfits (player, coach, and civvies) and with contemporary players from the 1920s and 1930s. 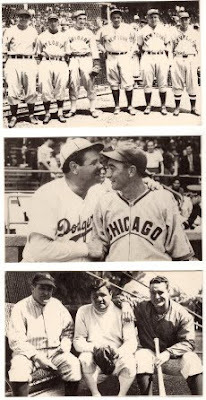 Interestingly, none of these 3 cards put the Babe in pinstripes. The Dodger coaching uniform looks particularly unusual, considering his immutable image as the King of all Yankees. Interested in one of these cards? Add a comment to the post and let me know! Well, let's do this in order. Since the All-Stars is spoken for, I'd be interested in the Dodgers coaching jacket. I like the last one with Joe McCarthy, and Lou Gehrig. OK, that was a quick one! Drop me a line at glidden dot matthew (at gmail) with your mailing address(es) and they'll go out on Monday.